The story behind Avatar's creation is interesting. Apparently the development executive at Nickelodeon was totally enraptured by the team's pitch, which went much longer and way more in depth than the average cartoon pitch. The co-creators also had much more respect for their outsourced colleagues than Western creators usually do, both being fans of anime and animation done in Asia. So they gave the Korean artists a lot more input into the work. One of the lead animators on Avatar eventually became a storyboarder in California and had a vital role in the creative side of producing The Legend of Korra. The series was also really strengthened by having Andrea Ramano as the voice director. A series like this would have been awful if the voices hadn't felt genuine. Thankfully Ramano has experience is casting from all the DC series like Batman The Animated Series through Justice League. Those series have some of the best voice work in TV animation from the last 20 years. 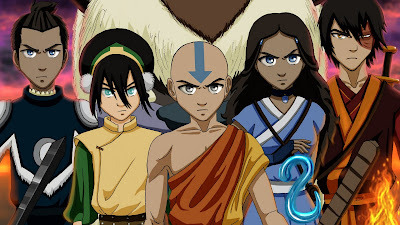 As for Legend of Korra, it also touches on even more mature subject matter, because the characters are older. And some of the villains are a lot more nuanced than Ozai. But it falls short in some places and the pacing can seem off. The first season is definitely worth watching. Personally I stopped watching somewhere in the fourth season, but I'll probably pick it up again at some point. American cartoon have been going in an interesting direction these days. Adventure Time, while still dealing mostly in self-contained stories that can be aired in any order, deals with some very dark subject matter. The Great Mushroom War and Simon's past are both unusual subjects for TV animation aimed at kids. There's also mini-series like Over The Garden Wall which have amazing art direction, dark subject matter, and tight storytelling. The art director for that show actually went to Sheridan for illustration in the 90s. There's also some Netflix series coming soon with more continuing plotlines, like Kulipari and some of the Dreamworks series. Most of those are actually produced in Canada. I recommend picking up a copy of "Avatar The Last Airbender, The Art of the Animated Series". Mike and Bryan recount their pitching experience in the first few pages. Bryan had been the art director on Invader Zim. After it was abruptly cancelled, he met with Nickelodeon vice president of animation development, Eric Coleman to discuss pitching. Eric told Bryan that Nickelodeon was looking for an Action, Adventure, Fantasy-Lore series in response to the Harry Potter and Lord of the Rings fanbase. Mike and Bryan pitched Avatar a month later, and Eric Coleman produced it. Eric has since left Nickelodeon to become the Senior Vice President of Disney Television. He is often credited with producing quality, creator-driven series with strong, developed characters. He also produced Spongebob and greenlit another amazing creator-driven series that I highly recommend, Gravity Falls. I got to speak with Mike and Bryan at length, during my internship at Nickelodeon. They praised Nickelodeon for giving them full creative control over Avatar, with very little instructional feedback. Mike and Bryan were directly involved with all aspects of development, and the production operated much like Disney/Pixar feature in which the story and episodes were discussed, pitched and developed in a team atmosphere. I got to sit in on some of these pitches and they were an incredible experience! Nickelodeon had a creator-driven policy back then, so much of their shows were developed in this way. I don't know if things have changed since Eric Coleman left. Based on Korra's development, I fear Nickelodeon has become more corporate since then. I fell in love with the term "Creator-Driven" in California. Most of the creator-driven shows I've seen have been exceptional, including Avatar, Gravity Falls, Steven Universe, and Over the Garden Wall. I wish Canada would adopt this production model.